I’m a foster through a local animal rescue called Secondhand Hounds. Even though I have quite a few of my own animal pals, there’s always room for temporary guests! I wanted to devote a page to the foster animals who have been a part of the family — both past and present. 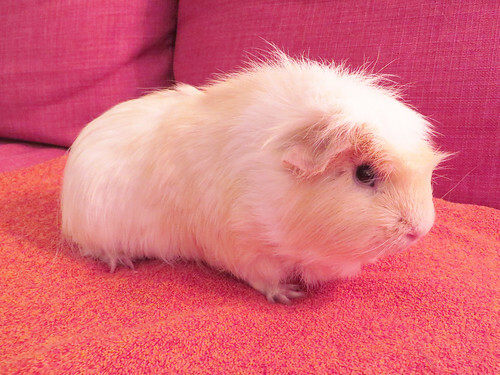 Baby (along with Teddy) came from a breeder situation. 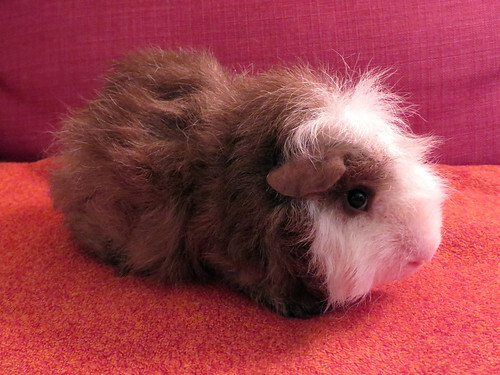 They were both very skittish when they came into my care, but Baby was the most skittish. I spent a lot of time holding him and getting him used to being handled. Eventually he got used to human interaction, and would sit with me for quite a while without trying to dart off. He enjoyed stepping into the food bowl and knocking it over, which always made me laugh. Teddy had a mild case of ringworm when he came into my care, and was slightly underweight. I made sure he and Baby were treated for ringworm (they recovered quickly) and made sure Teddy was getting enough food. He eventually got to a healthy weight (it didn’t take long). Teddy loved hiding in the pigloo and moving it around like he was a turtle. It was pretty hilarious. I had the two of them in my care for so long that they pretty much became family – it would be an understatement to say I miss them, but they were adopted into a great home with a giant cage and lots of love. 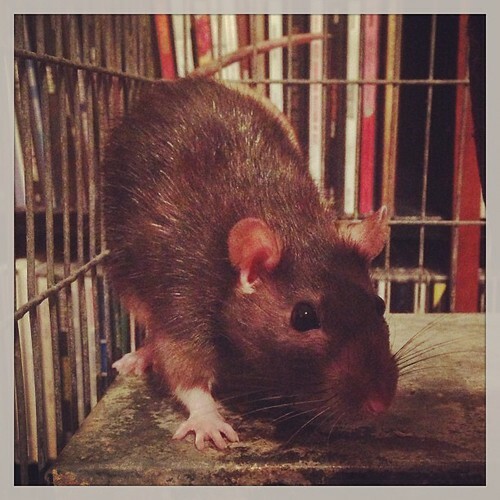 Sprinkles was one of three sister rats. The girls were part of a litter from a rat that was brought into Secondhand Hounds in 2012. They were adopted, but the adopter had to return them several months later. Sprinkles was the bossy big sister. She was usually the one who tried to steal food from Merida and Daisy. She was the most shy, and she kept an eye out for her sisters to make sure nothing bad happened to them. 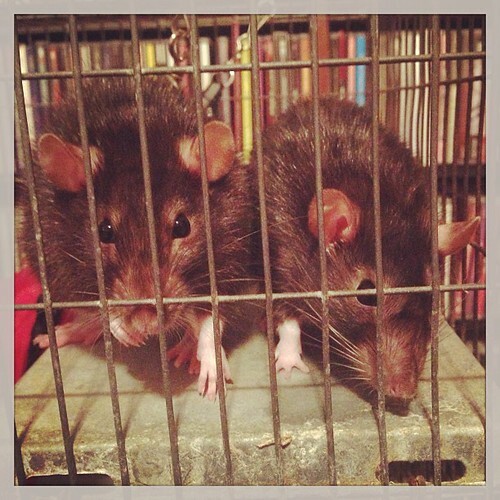 And this is Merida and Daisy, the other two of the three sister rats. Merida was the social butterfly. She was the first one to greet me when I opened the cage door, and usually scurried up my arm for a cuddle. Daisy was a little more shy, but she was very affectionate. She gave kisses almost every time I pet her. Merida and Daisy were inseparable. All three girls were adopted by an incredibly sweet family with three kids. They gave the girls a brand new mansion with tons of toys and places to hide. I’m so happy they found such a wonderful home! This is Bailey. Bailey was adopted from Secondhand Hounds and was returned a year later (her owner went into the military). I fostered her on the condition that she got along with Jack and Oreo. She was terrified of Jack, and nothing I did could calm her down when she saw him. She got along fine with Oreo, but something upset her whenever she saw Jack. I had to transfer her to another foster, but I loved having her around during those two months. 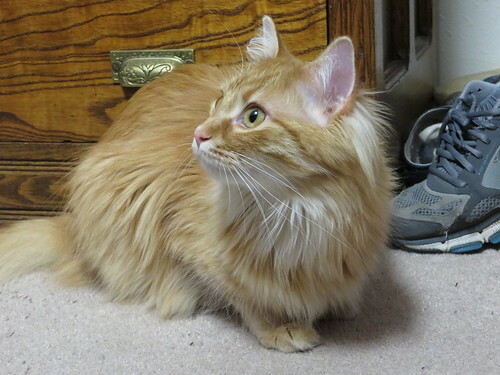 She was incredibly friendly, fluffy, and playful. Not to mention beautiful! I believe she was adopted shortly after transferring to her other foster home.